The Fellowship was fortunate enough to obtain a copy of USAGI YOJIMBO #144 from Dark Horse Comics. Stan Sakai (Usagi Yojimbo creator) wrote and illustrated the story. This is the second and concluding part of “Shoyu.” In part one, Usagi had arrived in a town with competing soy sauce breweries. The ronin had put out a fire that was destroying the brewery owned by Mitsui. After meeting with Hata, the competitor, Usagi believes that the fire was intentional. In this issue while Usagi hears the history of the two soy breweries, treacherous events are happening in Mitsui’s warehouse. Usagi gets Wada, the cowardly lawman, involve as the ronin decides to end this feud. After a lot of action and sword fighting, the story comes to a satisfying conclusion. This is my first experience reading the long-running comic and completely loved it. This is a well-told story with plenty of action that anybody can pick up and enjoy. Sakai’s art is very elegant and beautiful while being simple at the same time. 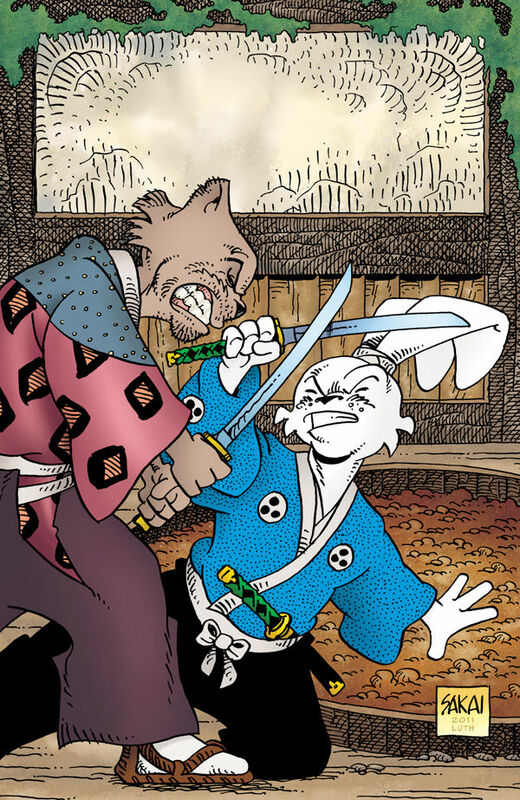 USAGI YOJIMBO #144 is in comic book stores now or available at www.darkhorse.com.